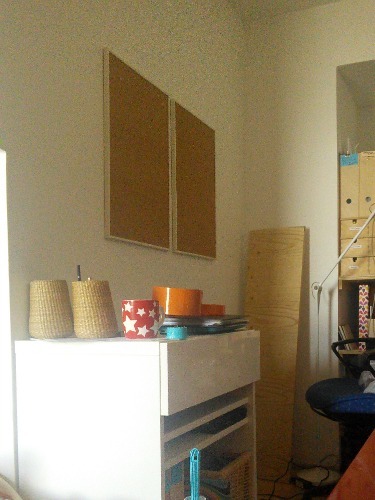 I've been so desperate for a desk and a couple of drawers for so long It was driving me mad. I like being organised; making lists, having my paper-clips colour coded, I like a place for everything and everything in its place. 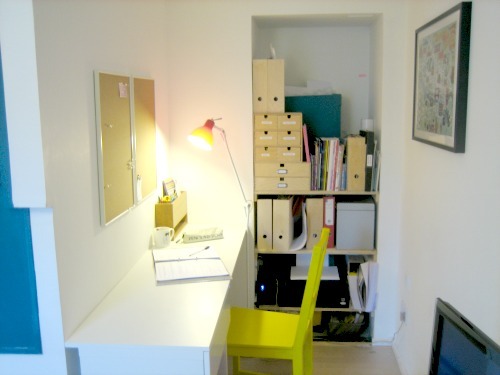 In our initial renovation plans we always had this little pocket of the livingroom/den designated as a workspace. This space sits in a wee nook behind our staircase. 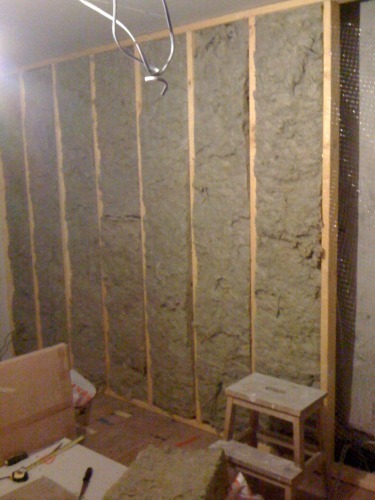 As the building work progressed, we decided to replace the plasterboard on the existing wall, adding a frame, running half a tonne of cabling round the back, and insulating. The space we had left to play with reduced considerably from 1.75 m wide to 1.35m which is small but not impossible to work with. 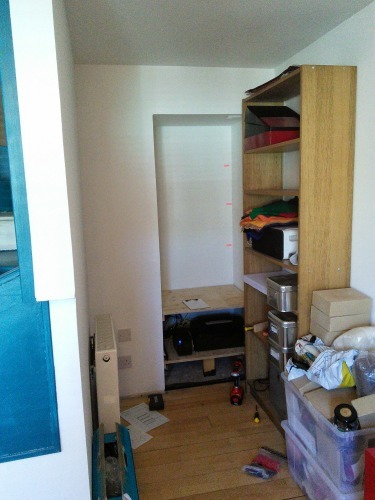 The large shelving space was once a doorway leading into a corridor which no longer exists. 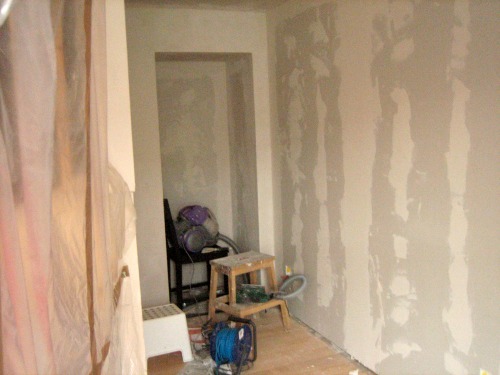 As you can see, the longer it took us to finish it, the more the space got filled with crap. 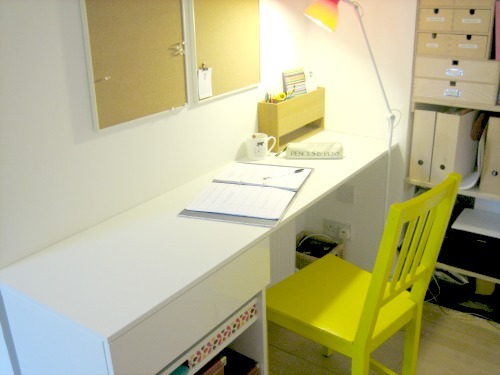 We were stumped looking for a desk that would fit the space. 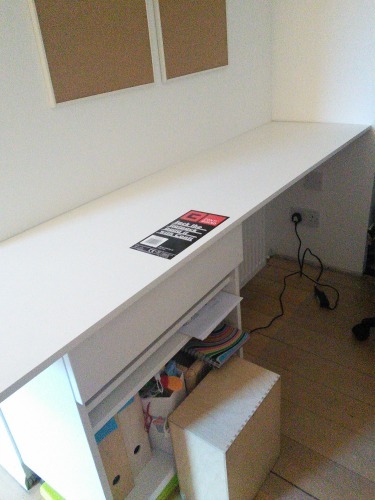 Anything off-the-shelf was too big, and I was reluctant to start building one ourselves (mostly due to time) I really wanted a simple white desk, but the dimensions were so unusual. Back in November I picked a storage unit that would fit snugly. So then for the desk top. We dithered over choice of materials and size, eventually deciding on 'Contiboard'. 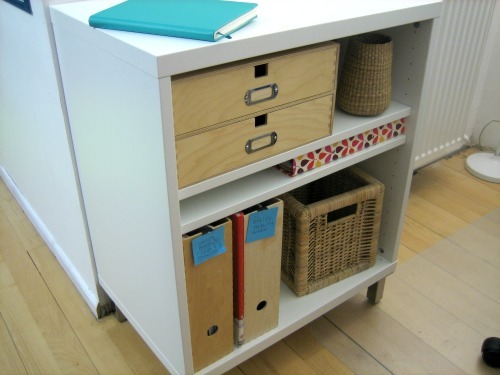 It is basically laminated chipboard (what most flatpack furniture is made of) Available in a range of sizes; we bought 46cm wide which is just deep enough for a desk top and fits neatly in the space we have available. 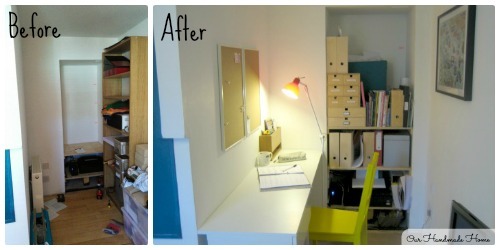 I didn't want legs cluttering up the already small and cluttered space, so I wanted to baton it instead. To ensure the (rather thin) desk top would be suitably strong and not bend I ran a full length baton along the back and side of the desk. 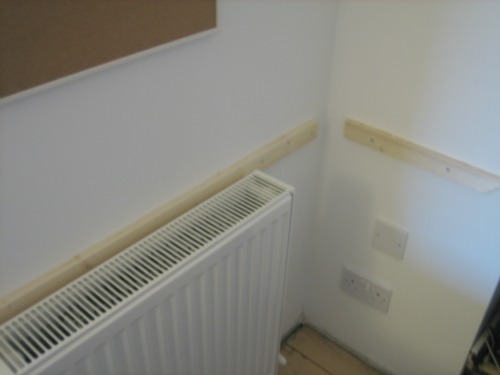 Here you can see our other design hurdle as the only place for a desk was also the only place for a radiator. Hopefully the Contiboard will withstand the constant fluctuation in temperature better than plain wood, only time will tell though. The contiboard was easy to work with, putting on the edging strip at the cut end was tricky but worth the extra time. I added a bit of art work to brighten up the space, and make it feel more homely. I think it all looks pretty damned good and fits the space perfectly. So here is our new workspace in all its glory! And here for your viewing pleasure is the side by side shot.